The meetings took place at the International Campus and at the UN Compound, near the Mogadishu International Airport. EU NAVFOR Force Headquarters Commander, Rear Admiral Hernández arrived in Mogadishu today, where he met with colleagues of some of the international bodies working in Somalia. The meetings took place at the International Campus and at the UN Compound, near the Mogadishu International Airport. During the Commander’s visit, he met with—amongst others—the representatives of the other two EU missions in the area, Mission Force Commander of EUTM, General Spreafico, and Head of the EU CAP Mission, Mrs Maria Cristina Stepanescu. 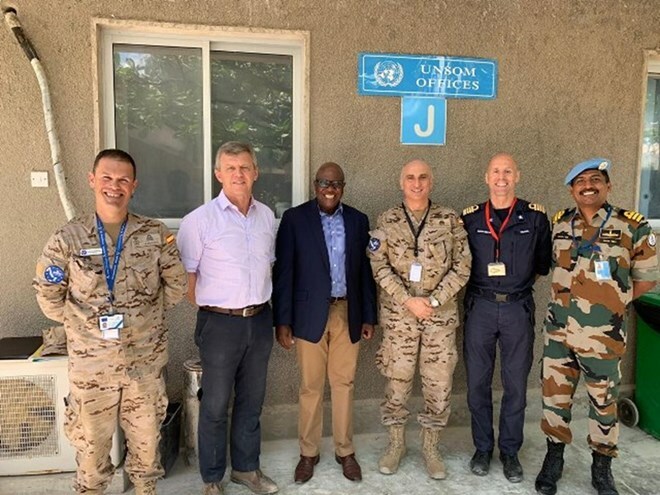 Rear Admiral Hernández also met Mr Raisedon Zenenga, from the Office in Charge of United Nations Assistance Mission in Somalia (UNSOM); the World Food Programme Deputy Country Director, Mr Emmanuel Bigenimana; and the United Nations Office on Drugs and Crime (UNODC) Head of Office, Mr Adrien Laurent Parrin. Enhancing Cooperation and exploring synergies amongst all partners is key for creating a safer environment in Somalia.